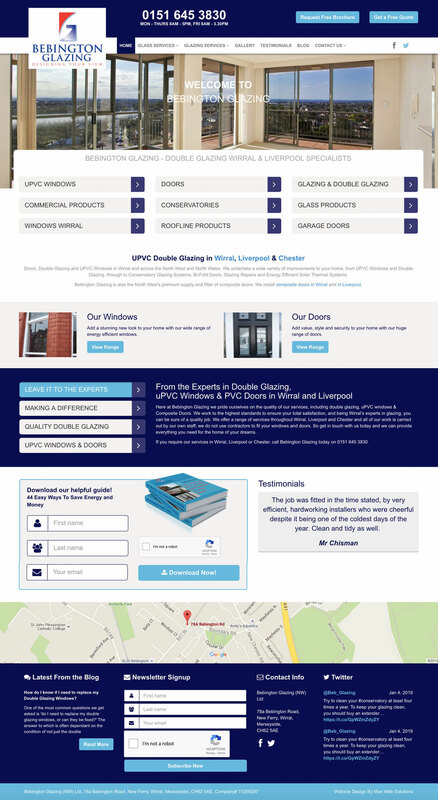 The team at Maxweb have worked with Bebington Glazing over the last 7 years, we have developed a number of websites and coordinated their online presence to ensure they rank top of the search engines for all of their key searches, such as Double Glazing Wirral, Double Glazing Liverpool and uPVC Windows Wirral. This service is knows as SEO. learn more about our SEO Services Wirral now. Bebington Glazing work on a huge range of projects across both the domestic and commercial sectors. Taking huge pride on the quality of their services, they successfully deliver hundreds of projects each year including double glazing, uPVC windows & Composite Doors. Working to the highest standards to ensure your total satisfaction, and being Wirral’s experts in glazing, you can be sure of a quality job. When it comes to double glazing, quality matters. If you want to be proud of your home and you want windows that perfectly match the style of your property, then Bebington Glazing can help. As the experts in double glazing in Wirral, they can offer you a choice of finishes to suit your home perfectly.